Any experienced Paid Search specialist will acknowledge that AdWords extensions are a simple and effective way to optimize text ads. In this post, we’ll cover 11 different types of ad extensions (note: there are more) and how they can be applied to a retail or ecommerce business. Here’s an example of an AdWords ad featuring Sitelink extensions (in the green box). These provide significantly more information for the shopper than a normal text ad and also take up almost 2x the amount of real estate on the SERP. Adding extensions is a matter of knowing how to integrate different pieces of information with your ad, with some being easier to implement than others. These are essential ad extensions for a retailer if you do indeed have a good overall track record in terms of customer service and shipping–and can sway a customer in your favor. More info on where Google grabs reviews here. Pro-tip: If you’ve noticed your Seller Ratings aren’t surfacing as much, it could be because Google recently increased the number of reviews required for Seller Ratings–going from 30 to 150 over a 12-month span. Sitelink extensions are “deep” links to specific landing pages below your ad. These links can be targeted landing pages that you’ve identified as your most popular product categories or brands. You can have up to about 12 active sitelinks but can only 2-6 (for desktop/tablet, six is rare) can show for a given query. Google will rotate these sitelinks based on relevancy of the query. If you’re not sure about what type of headline to use, check out our post covering which headlines drive the most conversions. You can manually add reviews to your ads. However, don’t make the mistake of thinking you can make up reviews because anything you submit, whether it’s a paraphrased review (ex. #1 Best Costume Retailer) or an exact quote review (ex.”These guys rock.”), will be reviewed by Google and verified with the 3rd party review source. Call extensions help influence shoppers to reach out to you directly rather than going to your site and potentially bouncing from there. However, they’re a particularly effective and convenient feature for mobile shoppers. Ideally, you’ll have call tracking in place to complement your call extensions. Call extension performance is tracked by setting up a Google forwarding number and defining how you want the length of the call to count as a conversion. Choose which campaign you want to apply the call extension to and add a new number. Use a Google forwarding number OR use your own number: Unless you have your own separate system for tracking call conversions, use a Google forwarding number. This way, you’ll be able to see how much business is coming over the phone directly in the AdWords login, with mobile call conversions being reported in the normal conversions column and call conversions from desktop users in the Estimated Total Conversions column. Show both website + phone number OR just phone number: This only applies to mobile searchers. So if you’re a retailer with a B&M location nearby, it might be better to display only the phone number. This should also be considered if you don’t have a mobile-optimized site and are not confident in your ability to convert a mobile shopper. Device preference to mobile: Check this if you’re optimizing specific text ads or ad groups for mobile shoppers. Advanced options: Scheduling is useful here if you don’t have a 24/7 call center. So, for instance, if your customer service reps are only in from 9-5, it may make sense to not advertise the number at 3 am. You’ll also want to check the box to count calls as phone call conversions. A given retailer with call extensions implemented may be receiving 20% of their monthly orders via the phone, and without a proper call conversion tracking system in place, they may never know it. Next step: define what a call conversion is. Ultimately, call extensions are extremely useful for ecommerce sites, essential for stores with B&M locations, and influential in driving mobile CTR. The definition of a call will vary from business to business, and so you’ll need to define this yourself. Does a 3-minute call usually mean that an order was made (or will eventually be made)? Do longer calls typically mean higher AOV for your business? Of course, a 15-second call with someone who needs a quick piece of information should not constitute as a conversion. You also have the option to set a conversion value per call here (what’s your typical AOV for a given transaction?). Of course, a 15-second call with someone who needs a quick piece of information should not constitute as a conversion. You also have the option to set a conversion value per call here (what’s your typical AOV for a given transaction?). Consumer Ratings annotations is an opt-in program that serve the same purpose as seller ratings. While not as visually striking as seller ratings, they do get more specific into certain aspects of your business like selection, customer service, and the overall quality of your website. If you’re a retailer with an app in the Google Play or Apple App Store, you can drive shoppers there with the App extension. When you’re talking about AdWords app extensions as they pertain to retail advertisers, you’re probably talking to a small crowd. App extensions (and apps in general) are relatively unexplored territory for even many major retailers. However, apps give retailers the unique opportunity to remain top-of-mind and find a home where their shoppers spend a huge chunk of their time–their phones. Clickthroughs on the app link will cost the same as a click-through on your site link, so if you do have an app, it’s worth your time to run a test of the app extension and see if the value of a click-through to download your app is in line with a click-through to your site. After saving, the app extension should take a little bit of time to verify. If you know your app is even more functional than your mobile site and has great ratings, then you can feel confident in prioritizing your app extension over others when it comes to mobile devices. The opportunity to live on a consumer’s phone is too great to pass up, especially if you’ve already sunk a lot of time and resources into your app. Of course, if after a month or so the historical data doesn’t support you continue showing the app extension, it’s probably better to prioritize a different ad extension instead. The feature can be integrated at the account, campaign, or ad group level and also be filtered to only show for certain devices: all, desktop/tablet, or phone only. The key to location extensions, however, are the insights that they provide to the Search advertiser. Depending on how many stores you have, it’s huge that you filter locations by following historic performance in order to limit wasted ad spend and identify new opportunities. The offline impact of online campaigns: How well are your ads driving foot traffic? Optimal geo-targets for paid campaigns: What areas/regions are driving the most conversions / wasted clicks for you? Actionable steps for improving localized campaign performance: What changes can you make to your campaigns to increase ROI? You’ll need a Google My Business (formerly Google Places) account to integrate your store information with your ads. Assuming you’ve already set up your free Google My Business account, the first step is to link that account with your AdWords account. Pro-Tip: We recommend you apply location extensions at the campaign level. Given that you’re breaking out your different physical store locations out by campaign (i.e. a campaign for Walmart San Diego and a separate campaign for Walmart Orange County), you can apply your location extension to each and add filters so that the address shown for your ads only is only for the campaign’s store location. Once you’ve collected 30-45 days of geo-data, you can start making informed decisions on how to bid differently on your ads. You can head to the Settings tab > Locations and add locations/view performance from there. The reality is that geo-targeting can be a very complex task in terms of following data (in both AdWords and Google My Business) and consistently modifying bids from there. Starting at the state level, you can move into cities, zip codes, and ultimately radius zones to certain hot spots of your shoppers. Notice there are actually dates for how long the promotion is valid. This extension is still not featured on Google’s AdWords site, as it’s still in beta and Google hasn’t rolled it out to all accounts. If you’ve applied for Promotion extensions and would like see if your account is eligible, you can access the feature in the “Labs” section of AdWords. Callout extensions give viewers an at-a-glance view of what makes your brand appealing. In addition, you can rewrite Callouts to reflect sales and more, all without changing the performance metrics. Once the viewer clicks the “Message” extension button, they will have the ability to text your brand (assuming their phone has that capability). Advertisers can create a pre-written text message, and it’s a great way to kick off communication and offer help to push the buyer along in their purchase journey. Upon their initial introduction, Structured Snippets were dynamic automated extensions. While the performance was promising, advertisers had little control over an ad’s Structured Snippets copy. Google has since changed the facilitation of structured snippets, giving advertisers more control. 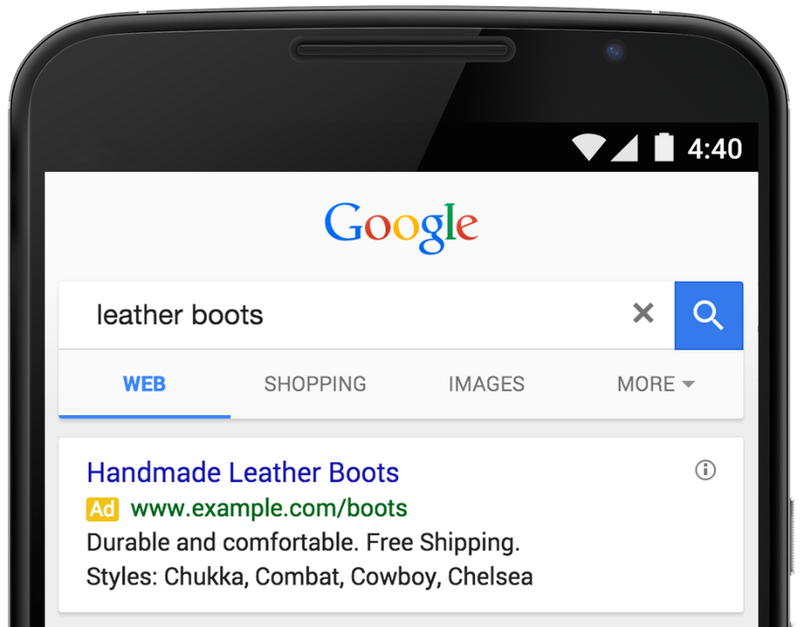 Information in structured snippets are no longer left to being automatically populated, and instead, display the ad copy you believe to be most valuable for shoppers and your brand. This will let you highlight the main features of your product or service exactly how you want them to be displayed. Structured snippets only account for one line of copy in an entire text ad, but are actually made up of a few different components; the major components being the header and values. Header: the header is the snippet type that best reflects a category, feature, service, or product that your business offers. Values: custom copy that allows you to list at least 3 features, services, or products related to your header. Each item is limited to 25 characters. Device: here, you have the ability to select mobile as a preference. Choosing “Mobile” will indicate that your ad or extension is optimized for mobile devices. Scheduling options: Scheduling controls the days of week and times of day that your extension can run alongside your ad. Of course, not every option is going to be viable for or relevant to all businesses and only one header can be chosen per snippet. As a result, it’s important to choose a suitable header option that best highlights your product or service offerings, or otherwise aligns with your overall campaign. Custom values need to include, at least, three descriptions and can include as many as 10. Each value is limited to 25 characters, so they should be brief and to the point. Incorporating structured snippets into an ad is far from being an arduous process and is really only a few steps of initial setup. From there, once your structured snippets have been approved, you’ll be able to leave them running or edit them as needed. Choose the campaign or ad group you’d like to add structured snippets to, or stay at the “All campaigns” level to to edit an account level structured snippet. From the View: drop-down menu, choose Structured snippet extensions. Click +Extension, then click +New structured snippet. Choose a language and then a header from the drop-down menus. This header will be shown in front of the values (snippets) you enter. Enter at least 3 values. These values should be specific items or attributes that match the header category. Structured snippets only encompass a small portion of an ad, and how they’re incorporated by businesses will vary dependent on type. As such, advertisers should look to be flexible and creative in how structured snippets are incorporated. Understanding how you can most effectively showcase your product or brand will likely improve an ad’s conversion efficiency. Below are a few examples of how structured snippets can be utilized different. The “Type” header can be used to highlight more than a single product. In a search query for “Nike running shoes”, the company is able to promote other categories from their apparel line without taking too much focus away from the initial search. The “brands” header is ideal for retailers carrying many different lines. In a search for “monitors”, Dell is able to list the different brands available, which shoppers may find useful when looking for comparisons. Similar to the previous two, this header option allows advertisers to list off various product types – or in this instance, specific style types. In any case, how headers are used will be entirely up to you. The best thing to do is find aspects of your product or brand potential customers may find most valuable, and highlight those the most. The most important thing to note is that structured snippets, despite how small, can be an additional tool for advertisers to utilize when competing with other brands vying for visibility. “When it comes to relevant text ad real estate on the SERP, more is better” said Adam Harms, Retail Search Manager at CPC Strategy. I’ve found Structured Snippets are effective on high-funnel search campaigns, since the extension allows me to tell more about what the retailer offers in a succinct, bullet-point format. For example, let’s say I’m building a campaign for an outdoor furniture retailer. If a user searches something relevant, but non-specific like ‘outdoor furniture,’ we’ll want to show up with an ad from a high-funnel campaign. Smaller companies will find that Price Extensions offer them the ability to compete from a price standpoint, particularly if they’re not a well-known brand. “I like to compare price extensions to sitelinks since these are clickable extensions that can direct to another page on your website. When comparing the two, so far I’ve been seeing price extensions get a higher CTR on the actual extensions than sitelinks,” says Román Fitch, Retail Search Manager at CPC Strategy. “Price Extensions will be great for smaller companies that are competing against larger brands in a space, who are really price-competitive. It’s not always easy to be competitive in text ads, but this will give them the edge,” saysto Meghan Parsons, Retail Search Manager at CPC Strategy. It’s worth noting that both of Google’s examples of Price Extensions are based on services—a salon and an auto shop. We predict Price Extensions will be especially valuable for service-based companies. “If you are a beauty salon, and your Price Extension shows how much you charge for a haircut or color—it gives you much more control over real estate, and helps potential buyers take action sooner because they don’t have to click through to your site,” says Lewis Brannon, Paid Search Manager at CPC Strategy. Finally, Brannon and Parsons predict Price Extensions will benefit subscription-models-based companies, as it’s simple to display various price points for subscription packages. Wondering what else you can get out of Price Extensions? This isn’t just an opportunity to appeal to the thrifty—there may be some searching for better value, even if it costs a little more. “Say someone is searching for a washing machine. An advertiser’s ad group for washing machines can show a Price Extension for three of my basic washing machines, and potentially, I could add on a bundled washer/dryer deal in one of those slots,” Brannon said. There’s nothing better than dominating the top of the mobile fold. “If you’re running upgraded Sitelinks with description lines, the description lines don’t always show, but for Price Extensions, you’ll get those extra 25 characters,” says Fitch. Are you currently getting a lot of clicks but few conversions? Prices at the SERP level means your audience will be informed before they click. “If your audience is price conscious and your products are on the expensive side, before Price Extensions, you may get a lot of unprofitable clicks,” Parsons said. This could also mean better leads for advertisers. “If price is a barrier to entry for some of your customers because you have higher price points or a luxury item—or your offering is more high end than most of your customers would be interested in—you can immediately improve your lead quality by sharing that information up front,” Brannon said. “Price Extensions should have a positive impact if your account structure is built for it. As an agency, we don’t recommend that advertisers apply one blanket extension at the account level. We would recommend aligning your Price Extensions very closely to the keyword theme at the ad group level,” Brannon said. Why? Well, if you have multiple ad groups with slightly different themes and variations, you want to apply Price Extensions the group level so you can provide the most specific results for the user. For instance, if you have an ad group for women’s haircuts, you’d want to provide the most specific prices for that group because you wouldn’t want men’s haircuts to show up for that female searcher. Price Extensions used in combination with the right extensions will give searchers the best experience and could potentially boost conversions. “I’m thinking you can leverage Price Extensions with Sitelinks, Callout Extensions, and Call Extensions. The Price Extension allows you to provide several options that you’re price competitive on and drive users to those category or product pages. Sitelinks allow you to try to cross-sell a different category,” Fitch said. You’ll be charged the same amount no matter where the user clicks—the ad or the extension. You won’t be charged for more than two clicks per impression. If someone quickly clicks on more than one link while viewing an ad, this may get treated as a duplicate or invalid click and you won’t get charged for the second click. Keep a close eye on your account when you implement Price Extensions, because you could show up less for broad keyword searches. “If you are used to acquiring traffic through very simple text ads, you could be taking yourself out of the market for potential customers at lower price points, and that could hurt your quality score so Google starts serving you less for those broad searches, like “trips to Tokyo,” says Brannon. CTR is a huge part of ad quality score. While you would theoretically improve your lead quality, you could potentially see a drop in your quality score if a large percentage of your current market is price-sensitive. Pro-tip: The key here isn’t to panic if your CTR or Quality Score drops a bit within a couple days of implementing Price Extensions. Wait up to two weeks to measure results, then change your strategy if necessary. Keep in mind that Price Extensions are currently only available in English, so if you cater ads to an international audience, you’re out of luck for now. More languages will be coming soon, so stay tuned. So, should advertisers expect similar results from price extensions on desktop? “I do anticipate that the results will be more positive,” Eliza Cuevas, Sr. Retail Search Manager at CPC Strategy said.